We need to remember these aspects of process if we are to properly form both ourselves and others. Let us think about how we can promote better formation in the Church. The first criterion, “comprehensive, kerygmatic, and ongoing,” is like “length, breadth, and height”: it ensures that formation is in no way flat. But formation also needs to have the other dimensions. “Ongoing” means it needs to continue through time – perhaps the “length” of our life. Not just at the beginning, nor just in the middle, but all the way through. That makes “comprehensive” like the dimension of “height”: formation needs to attend to all areas of life. These criteria come from St. John Paul II’s exhortation on priestly formation, Pastores Dabo Vobis. It’s nice, on the one hand, to consider them in relation to priests. We don’t want priests who are pastoral but can’t think, who are spiritual but lacking in human formation, or vice versa. A good priest must be “good” spiritually, intellectually, pastorally, and humanly. And so too must the rest of us be. This is Aparecida’s first contribution to Pastores Dabo Vobis’s four “pillars” of priestly formation: priests need formation, yes, but so do the rest of us! And we need our faith to penetrate all aspects of our life: not just one, but all four. 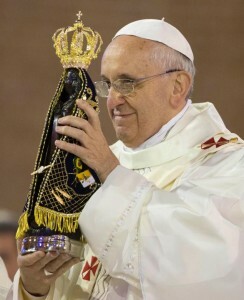 But Aparecida makes another great advance on Pastores Dabo Vobis, with a couple extra words. Pastores says “human” – Aparecida adds “and communal,” as it to define what human formation means. It doesn’t mean you should learn to play an instrument – or not exactly, anyway. It means you should learn how to be part of a community, how to deal with other people. That’s the heart of “human” formation. And to “pastoral” Aparecida adds “missionary.” Perhaps we see here best of all what Aparecida (and Pope Francis) mean by the insistence on this word. We all know that “pastoral” can often mean wishy-washy. But that isn’t the real meaning of the word. A truly pastoral priest – or layman – is not someone who leaves people in their ignorance and sins, but someone who is so passionate to share the light of the Gospel that he’s willing to be patient. “Respectful of process” means that formation needs to recognize that it’s dealing with people in need of formation. In intellectual formation (my day job), we have to realize that the people in our class don’t yet know what we have to teach them. We have to be patient, begin at the beginning, build upwards. We have to be gentle, recognizing that it’s hard to learn what you don’t know. But for the same reason, we have to be persistent: since they don’t yet know what they ought to know, it’s up to us to push them to see new things. But the same dynamic is true in all areas of formation: formation of ourselves or of others; formal or informal; intellectual, spiritual, missionary-pastoral, and human-communal. In working on our own human formation, for example, we need to be patient with ourselves – and also aware that we have a long way to go, and need to keep moving forward. And so we need to “make provision for accompanying the disciples.” We need to accompany those in formation both for its own sake – because Christianity is inherently communal – and because formation, by its very nature, is something we need help with. We who care about the spiritual life need to think about how we can accompany our neighbors through their lifelong formation. And so we must form ourselves and others “in the spirituality of missionary action,” always going out, always leading ourselves further by also trying to lead others more deeply into the love of Christ. How could our community better form its members? In what areas could we personally help the formation process?